Due to the attractive allowances offered by the government there are instances where the upper caste affluent people brings in fake caste certificate just to get all the special considerations. Go to atleast to two near by colleges and just look at the economic background of the so called ‘socially backward’ students who are getting reservation /concession and I am sure you will be surprised .Reservations are now for the richest! There is no reservation in defense sector. Do you know why?Because our country is not ready to take up any kind of risks in compromising with the quality of security. Then how can reservations in other sectors can be justified? How can one uplift the so called ‘backward’ class just by reserving some seats in education sector or the service sector without any proper understanding of the situation? What actually constitutes a backward class? What are the determinants of a backward class? Question arises how reservations can be made for something that has not been clearly defined or varies from state to state! Who all are the beneficiaries? What changes are made so far? Should the criteria for reservation should be the same? Currently, as per the government policy, there is 15% reservation for Scheduled castes and for the Scheduled tribes there is a reservation of about 7.5 % and for Other Backward Classes there is a reservation of 27.5%. So nearly 50% seats are reserved in the government sectors!!! Reservation on basis of caste was rightly introduced during the time of Indian independence because the weaker sections (backward class) of our society were deprived of many basic needs and were leading a very miserable life .They were all suppressed in the name of caste at that time. There was a valid reason and also was meant for a limited period of time. Even Constitutional expert Dr Bhimrao Ambedkar decried reservation to be the correct way for empowering backward classes and communities. Reservation indeed has made a positive impact in India .Because of reservation; we can see many of the people belonging to the weaker sections have proved their caliber. But unfortunately, like in any field these reservations has been misused and missed out the target population like the poor and needy one of the backward classes. Still in few areas reserved seats go vacant as the authority fails to identify qualified people for the vacant position both in educational and service sector from the backward class. If the SC/ST/OBC were not able to get a decent elementary education then what is the point in reserving seats for higher education and in job sector? What the government should do is to provide free and compulsory education for everyone till the age of 14 (Proper implementation of the ‘Right to Education’ Act). Then everyone gets the opportunity to learn. It helps to filter the studious, talented and motivated students who wish to continue their studies .So reservation should be given to such students who are really motivated to do things in life and not to students based on their caste saying that it is for the upliftment of the students (or the society?). By caste based reservation what is actually the outcome? Is it for the upliftment of the caste or the individual? There are students who are deprived of higher education just because of their economically backward condition. So there should be a system where the government must financially aid those students and not based on caste. In fact I doubt as how many SC/ST/OBC are aware about the reservation system? Is it meeting the target population of the needy poor? We are actually making different sections in society by these caste based reservation. Reservation says that the SC, ST and OBC are still backward even after we give reservation for the last many years. When can we say that they got empowered? 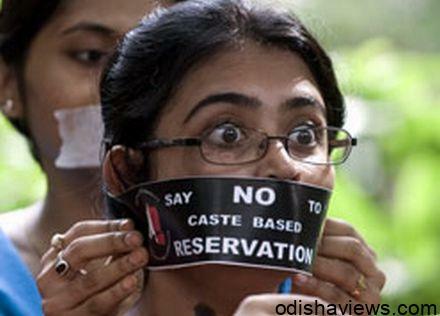 Is caste only a criterion to group people for providing reservations? My question here is why can’t we go for reservation based on ‘Income certificate’ rather than ‘Caste certificate’? A person whose family income is less than two lakh per annum and who has secured more than 80% mark for the latest qualifying examination can be eligible for getting reservation in educational sector. Manipulation of data and corruption will be there even in such kind of reservations but still think of the fact that by caste based reservation we are continuously saying that the SC/ST/OBC were all weak and they will continue to be the same through out. This actually discriminates people based on caste even now and creates division among the society. So by introducing reservation based on economic conditions we can at least ensure that the importance of ‘caste’ will gradually decline and people won’t care about caste. Changing caste for getting ‘special consideration’ will be no more a common scene.